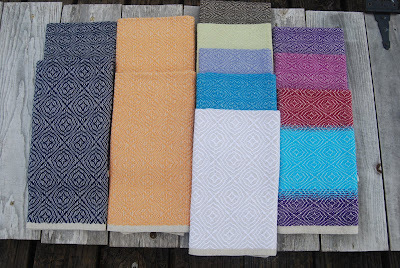 Weaving is something that I have had in the back of my mind for the last couple of years. 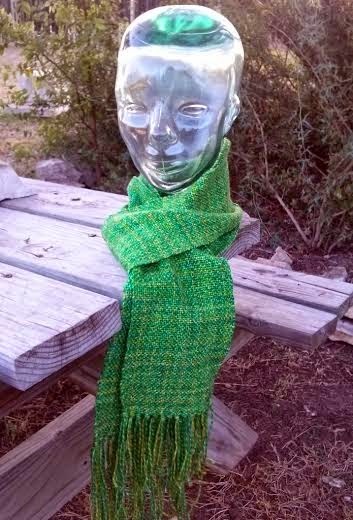 Every now and then, I would mention to a friend whenever the topic came up: "One of these days, I am going to try that, but right now, I have too many projects I want to knit." Over the last several months or so, one of my good friends, who has three looms, told me she had a table loom she wanted to sell. She offered several times to bring it by for me to try out, but I resisted. Well, I resisted until I saw that Maria was jumping into weaving in a big way. Maria is the one who inspired me to try my hand at lace knitting a few years ago. Maria is a knitter, quilter, and crafter extraordinaire. 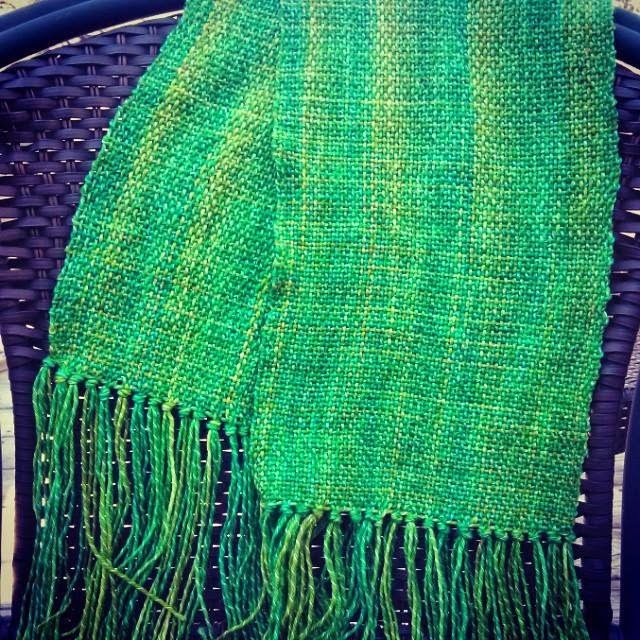 So, the next time my friend brought up the loom, I told her I would like to try it out. She brought it over immediately and spent a long Saturday evening helping me sort out and install 500 flat steel heddles on a Schacht 25" 8-harness table loom. 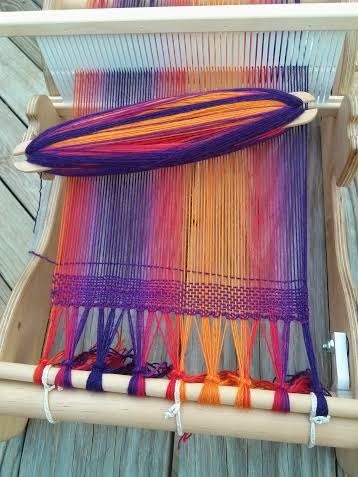 There was not enough time that night to try to warp it, so the next day YouTube became my friend and I figured out to warp it front to back and back to front, although my initial weaving efforts, while perfunctory, were not stellar. I decided I needed a class. This past Sunday, Wee One and I participated in a beginning weavers class using 10" Schacht Cricket looms. These are very basic rigid heddle looms, but superb for learning and cranking out quit projects. Scarf numbers 1 and 2 were made using Mountain Colors Twizzle in Harmony Sweetgrass. The first one above was warped in class using just one skein (250 yards). It's dimensions are 8.25" x 50". I liked it and had a second skein of the same yarn available, so I warped again, this time more narrowly with longer warps. The one below came out 5.5" wide and 70" long. Perfect! BOTH of these were started and finished in the same day. In fact, all four were made in about four hours each. In addition to the yarn Wee One selected to make her own scarf, she also picked up two skeins of Ella Rae Lace Merino dk in color #207. The loom she was using had a heddle that wrapped 8 stitches per inch, and the one loaned to me was 10 stitches per inch. Because the Lace Merino dk is rather fine, I decided to warp it on my borrowed loom. It came out 9" wide and 67" long. The staggered knotted fringe was something I had seen and decided to try out on a whim. I think it is stunning! The fourth scarf (which is the top picture of this post) uses Noro Kureyon Sock. The color is S219. 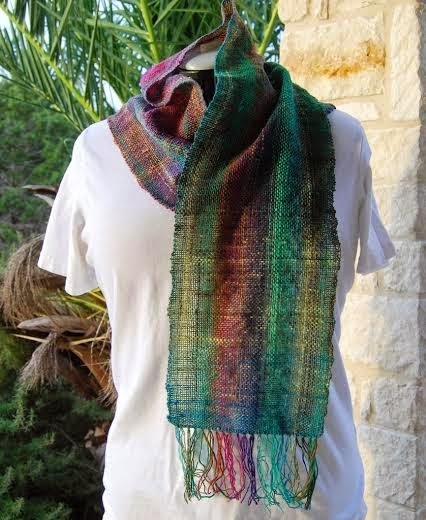 What is interesting about the Noro scarf, is that it is a very fine yarn warped at 10 stitches per inch. This created a very loose and drapey fabric. The other neat thing about the Noro scarf is the hemstitch finish I worked on the edge. Tutorial here. This also contains an experiment. That hemstitch from the Noro scarf? 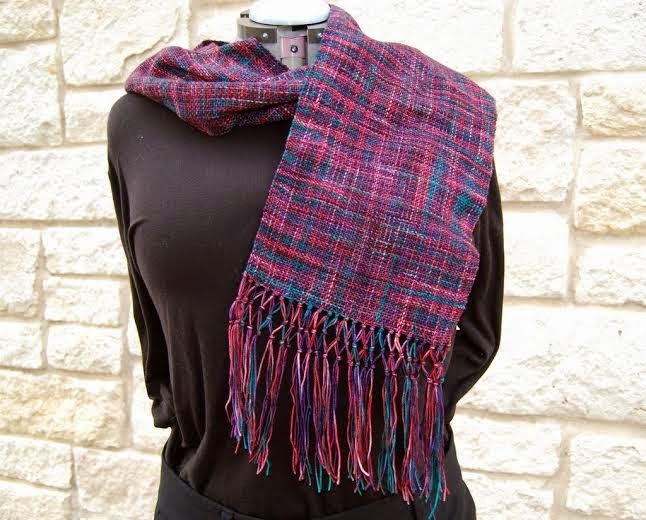 The tutorial had me to do that on the far end when I finished weaving, then cut the edge from one end of the loom and unroll the scarf until I got back to the close end (or starting point). Then, without tension, as half of it was already cut from the loom, work the hemstitch over the starting edge. For me, and I may not have been doing it properly, the hemstitch on the starting edge was not as neat or pretty as it was on the far end. Therefore, I decided to work the hemstitch after I worked an inch and a half from the very beginning of the scarf. What you do not see are the scrap pieces of yarn I used to draw the warps together before I started weaving with my proper weft yarn. I pulled them out after I did the hemstitch. Once the scarf is complete, we can compare hemstitch edges. 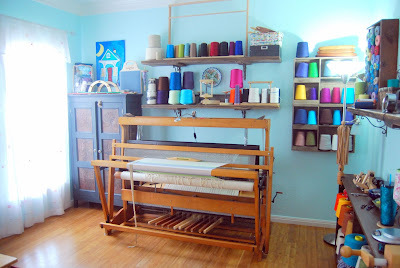 What about the massive table loom, you ask? In the meantime, the Cricket will continue to be put to good use! So much so, I anticipate purchasing a 15" Cricket, just to have for those quick fixes. One last thought, the cool thing about weaving: The number of weaving works in progress is limited by the number of looms on hand. Thus, you really must finish one before starting another! I love reading about your latest addiction! You are such a doll! I can't wait to show you in person! HAHAHAHAAA! Maria! You are evil!